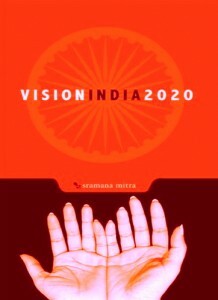 Vision India 2020 by Sramana Mitra describes where India could be – or should be 10 years down the road. Is the country destined to remain an outsourcing haven? No – and anyway, this outsourcing industry shows some cracks. Is its historical heritage doomed to disappear entirely? Yes, if nothing is done. Are the sprawling slums going to turn into a playground for criminal activities or gigantic cutthroat arenas in Mumbai, Kolkata or Dehli? Maybe, if nobody cares. Some predictable catastrophes only happen to those who choose to bury their heads in the sand. Sramana’s Vision India 2020 is an entrepreneurial utopia, as well as a personal and intellectual futuristic autobiography. “If I could help my country evolve, what would I do?” Sramana asks herself as a premise of the book. She starts with her life-story, which took her from India to Smith College, MIT and then, Silicon Valley, and then projects herself ten years down the road, describing how India has evolved into a state-of-the-art, modern country. It all changed with a stronger educational system (an MIT India, an effective K-12 teaching methodology, or Harvard Medical School India) and incentives to leverage local talents and attract foreigners, with the practical applications of new technologies, the revamping of the country’s infrastructure as well as an optimal and creative utilization of its vast natural resources, its sophisticated human and cultural heritage. Vision India 2020 is not a fairyland, but the description of a new present based on an extrapolation of capabilities that are at our disposal today. In 2008, Sramana saw the potential of Energy Discovery Inc. (ERI) when her husband, Dominique Trempont, joined the board of this company founded by a Norwegian Entrepreneur, H.P. Michelet. At a time when humanity faces a global water supply crisis, is it beyond common sense to think that desalinisation plants along the coast of Orissa should provide water to the South Indian states? So much smarter than diverting rivers from the Himalayas! Is a “Doctor on Wire” telemedecine franchise for rural India an odd fabrication of the mind? The concept is here today. It’s not a stretch. It’s a matter of scaling with a purpose or simply applying what we know today. What prevents an entrepreneur from creating Zen retreats similar to the one at Tassajara in California amid the rice fields of Bankura? Nothing. 1) It is well written: India is so vividly pictured that it’s hard to think that it’s not yet real. 2) It’s a passionate plea of a woman from India to a country that she loves. Her life today is definitely international. Most of what she loved in her childhood is gone with the mango orchards of her grandfather in Rajarhat, but she is not trying to resurrect the past. She wants her homeland to exceed her dreams. 3) It’s a great entrepreneurial message: It’s any entrepreneur’s responsibility to change the world for the better. While nostalgia sounds great, expanding the world of what’s possible is ten times more exciting. 4) It’s courageous: Most prospective books distill pompous predictions without taking the risk of talking implementation and telling you how things can look in practice. Experts on the future of India undoubtedly produce remarkable documents. Sramana has the guts to describe her personal vision as if it were reality with no jargon.